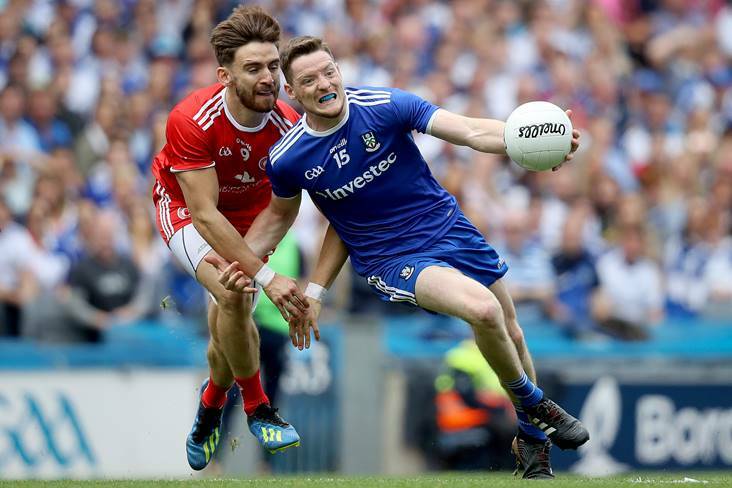 "He's smart, he bought a few frees"
Monaghan's Conor McManus with Padraig Hampsey of Tyrone during the All-Ireland SFC semi-final clash at Croke Park. Padraig Hampsey says he enjoyed his tussle with Monaghan sharpshooter Conor McManus on Sunday. The tigerish Tyrone man-marker restricted the Clontibret attacker to just one point from play at Croke Park as the Red Hands pipped the Farney County to a date with Dublin in next month's All-Ireland final. "I was just thinking of the next ball, next ball," the Coalisland clubman states in The Irish Daily Mirror. "I knew he was going to get a chance and to be fair he took it. I enjoyed it, it was a good tussle and he's a class player. "It was always going to be tough. He's a class act. He's up there with the best forwards in Ireland. He's smart. He bought a few frees - but I'd cover there with Collie [Cavanagh] coming back."